NOKIA 3.1 Plus with 6-inch HD+ display and MediaTek Helio P22 processor launched. HMD Global today announced the Nokia 3.1 Plus in India, a new smartphone with 6-inch HD+ display. The Nokia 3.1 Plus is the most affordable Nokia smartphone with a dual-camera and is the latest device to join the Android One family. The Nokia 3.1 Plus features a 6-inch HD+ display with 18:9 aspect ratio. It comes with 3500mAh battery that lasts two days between charges without needing a top-up. It's powered by a MediaTek Helio P22 octa-core processor for high performance and power efficiency. It's available in two variants - 2GB/16GB and 3GB/32GB. 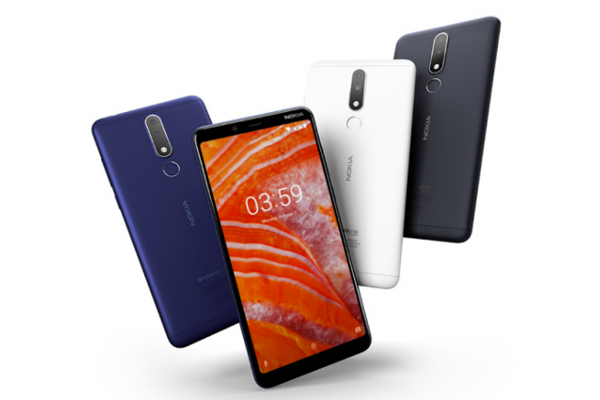 The Nokia 3.1 Plus joins the comprehensive line-up of Nokia smartphones in the Android One family. Nokia 3.1 Plus ships with Android Oreo pre-loaded. Its precision fit, CNC-machined rear aluminium cover delivers a seamless, pure design and combines with a die-cast metal structure for impressive solidity. The Nokia 3.1 Plus's matte, highly tactile finish with diamond cut detailing and curved 2.5D glass offers a precision crafted feel in the hand. It's equipped with a 13MP Phase Detection Auto Focus main camera. The rear camera also includes a 5MP sensor for rear depth sensing imaging to let you take professional studio style shots with selectable bokeh blur and allow you to adjust blur even after the image has been taken. On the front there is an 8MP camera to make your selfies stand out. Sensors: Ambient light sensor, Proximity sensor, Accelerometer (G-sensor), E-compass, Gyroscope, Fingerprint sensor. The Nokia 3.1 Plus comes in Blue, White or Baltic, and is available in India from October in two variants - 2GB/16GB and 3GB/32GB. The two variants will be available for a global average retail price of 159€ / ~$184 and 179€ / ~$207 / ₹11,499, respectively.